We are awaiting the arrival of our soldier for his 2 week break. And we are waiting and we are waiting and we are waiting. He left his base on Monday and we were SO excited because it seemed as if he were going to get here sooner than we had been told. What we did not know is that he was just moving to the next base to WAIT for a briefing. So, the briefing was held and we were given a date of departure from the country. And he has safely arrived in a SAFE ZONE. We thought we were going to the airport tomorrow morning to pick him up - and we were ready to leave BEFORE the crack of dawn to make sure that we were sitting in the terminal when he arrived. I had held off the extreme excitement - until we knew an arrival date. So I must say that last night my heart was fluttering with happiness - knowing that tomorrow morning he would be home. (even though we know that it is just for two weeks). How disappointing to get the phone call that his flight arrangements have been cancelled. We are in WAIT mode again. Hopefully it is just a short delay. Hopefully he will be in route later tonight. He will get 14 days at home beginning WHEN HE GETS HOME. And for that we are sooooooooo thankful. But we are ready. I will try to give an update... but for now, thank you for your continued support and prayers. Praying for a safe flight....ENJOY YOUR WONDERFUL VISIT!!! 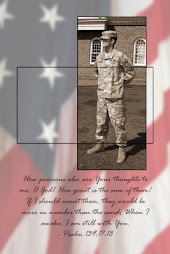 My husband and I pray for the servicemen and we appreciate their sacrifices on our behalf. We have a 19 yr. old grandson and we can't even imagine what it would be like if he were there so far away...and in harms way. But we know it would be so very hard for his family. Please tell your son Thank You for us. And we hope you will have a glorious 2 weeks with him. It's Beginning to Look Like Christmas AGAIN!